To troubleshoot issues with Veeam ONE, you might need to export diagnostic logs for Veeam ONE Monitor and Reporter. Diagnostic logs include information that can be used by the Veeam Support Team to troubleshoot issues occurring with Veeam ONE. In addition, diagnostic logs include information about managed virtual and backup infrastructures. This type of information is used to speed up the root cause analysis when troubleshooting issues. Alternatively, you can press [CTRL + S] on the keyboard. In the Support utility section, click Launch. 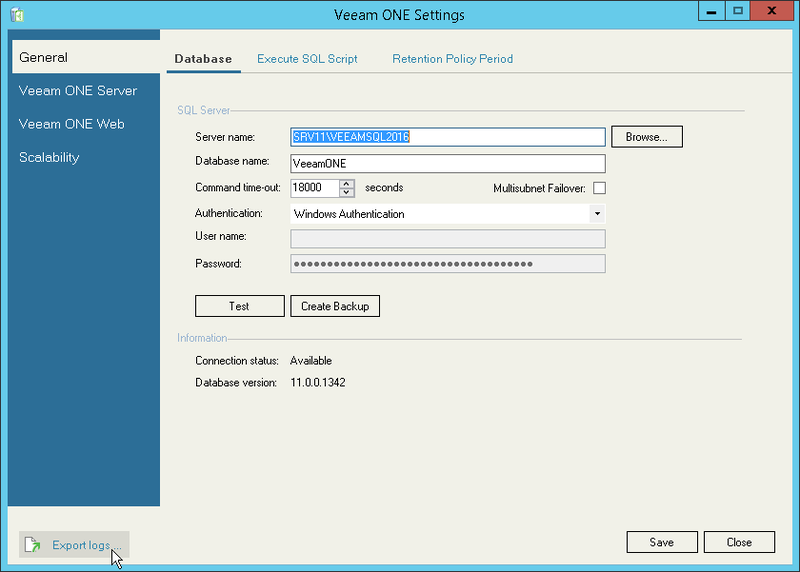 Veeam ONE will launch the Veeam ONE Settings utility. At the bottom left corner of the Veeam ONE Settings utility, click Export logs. Specify a location to which the exported logs must be saved. The Veeam ONE Settings utility will export logs and save them to a ZIP archive in the specified location.